The smaller dimensions of the safe mean that it can be kept in little spaces out of reach of everyone but still accessible to the owner. When the contents must be accessed, the state of the art locking mechanism is opened through the high-tech art of fingerprint recognition. The owner of the biometric gun safe may register up to 30 fingerprints that open the lock immediately after the safe is purchased. 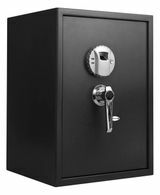 Some owners may want to have one or more fingerprints of other people who can open the safe in case a need arises in their absence. Important documents, valuables, and firearms are placed inside the safe for secure keeping and the safe is stored in an obscure location. Only the registered users that you have selected who have recorded a fingerprint in the safe will be successful in opening it. Having a biometric ammo safe in the house means that the weapon is kept out of the reach of small hands. 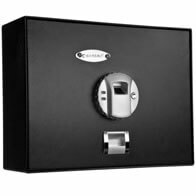 Valuable contents are protected from thieves who are completely unable to access the interior of the safe. If the contents must be accessed quickly, the touch of a finger in the correct position against the locking mechanism will open the lock and provide immediate access. No more need for finding the right key or remembering a complex numeric combination under duress. Most biometric safes include a key for traditional access in the event access to the fingerprint is not available, and the safe must be opened. Backed by BARSKA's One-Year Limitied Warranty. Choose from Biometric Fingerprint Safe, Top Opening Biometric Safe or Compact Biometric Gun Safe all biometric models can register up to 30 fingerprints of your choosing.The Digital Keypad Safe, features an easy to read bright LED display that retains one four digit pin. New Quick Access Biometric Rifle Safe by Barska allows you to keep rifles, guns & ammo stored securely and quickly accessible with a scan of your fingerprint. Store up to 4 rifles securely with removable storage shelf for guns and ammo. 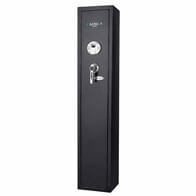 Barska's New biometric keypad safes bring storages security technology to the next level. 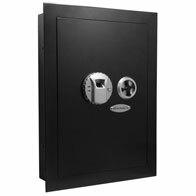 The new multi-access safes add versatility to function by having two independent quick access methods and a back-up key. Each access method functions independently fingerprint or keypad access as to not compound frustration and to give you peace of mind that you will always be able to access your safe in time of an emergency. Holds up to 32 different users and one pin code. Three biometric keypad safes models available Compact Biometric Keypad Safe, Standard Biometric Keypad Safe and Large Biometric Keypad Safe. 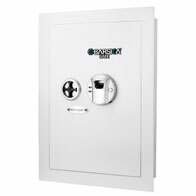 The all new large biometric safe by Barskais be enough to hold dozens of hand guns and ammo. Safely storing a firearm for home defense is being responsible. How much time do you have in the middle of the night to access a safe? In the time it takes to find safe keys or enter a combination it may be too late. 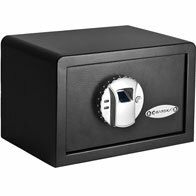 Barska's new biometric rifle safes allow immediate access via fingerprint scanning biometric technology to firearms for self-defense. 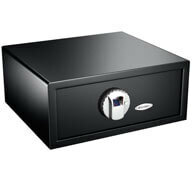 A biometric gun safe is the most secure means of keeping a weapon or other valuables in the home. 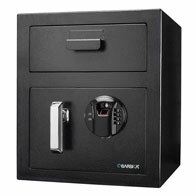 Barska biometric safes are designed for quick secure access of firearms and valubles. With five new models designed for long rifles, handguns, large valuables and multi- fuction user access.